Pittsburgh Steelers defensive back Troy Polamalu was named AP's Defensive Player of the Year, Green Bay Packers linebacker Clay Matthews came in a very close second, losing to Polamalu by two votes. Both players are game-changers and helped lead the top two defenses in the NFL to this year's Super Bowl. 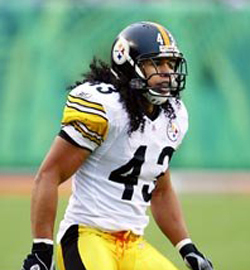 However, Polamalu is probably more of a versatile defender, able to sack the quarterback and come up with a big-time interception or hit. Also, Matthews is only in his second season in the NFL and will have many years to win the award.